David Peden was born about 1789, son of Alexander Peden. He married Sarah Topham on 13 July 1835 at St Mary’s, Hitchin in Hertfordshire, England. He and his wife Sarah (d.1862, aged 65, Newtown) had at least three sons and two daughters. He died at Paddington on 9 December 1867 and was buried at St Jude’s Church at Randwick. 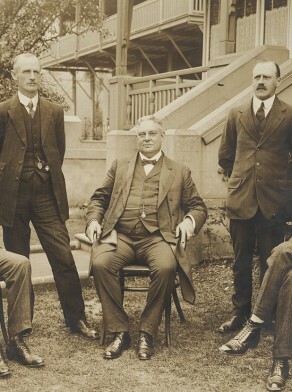 His son Magnus Jackson Peden (b.1834) became Mayor of Randwick and Magnus’s son, Sir John Beverley Peden (1871–1946) was Challis Professor of Law at Sydney University. The Peden family immigrated to Sydney in the 1830s. David Peden was in Sydney by January 1837 when his son Francis William, aged 8, died at Hunter Street. He had set up as a draper, supplying gloves to Government Orderlies. In February 1842, he was the honorary Secretary of the Australian Drapers Association with a house in Hunter Street. In November 1842 he donated towards the erection of Scots Church in Pitt Street. In 1844, Peden was an importer of hosiery, gloves and general drapery at Hunter Street. In 1858, David Peden, merchant of 478 George Street, had bought into the Camperdown Estate and had a private residence on Newtown Road. Peden was Councillor from 1 November 1849 to 31 December 1853 when Council was dismissed and replaced by City Commissioners. John M. Ward, ‘Peden, Sir John Beverley (1871–1946)’, Australian Dictionary of Biography, National Centre of Biography, Australian National University, http://adb.anu.edu.au/biography/peden-sir-john-beverley-8008/text13955, accessed 7 December 2012.